The difference between “big data” and useful data is having the right tools to analyze data. 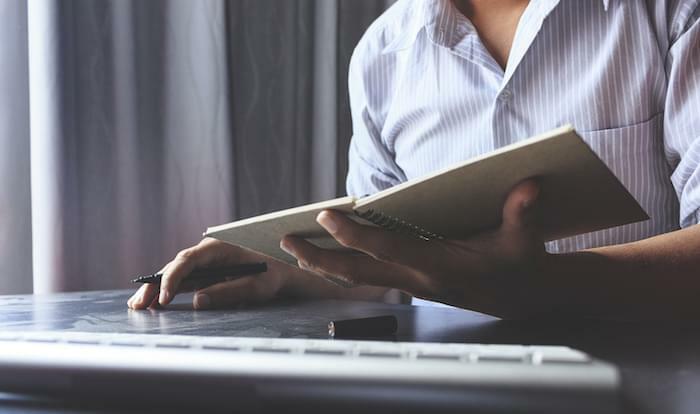 In an era when almost every department is flooded with information about clients, prospects, processes, and operations, effective data analysis can easily become a source of competitive advantage. 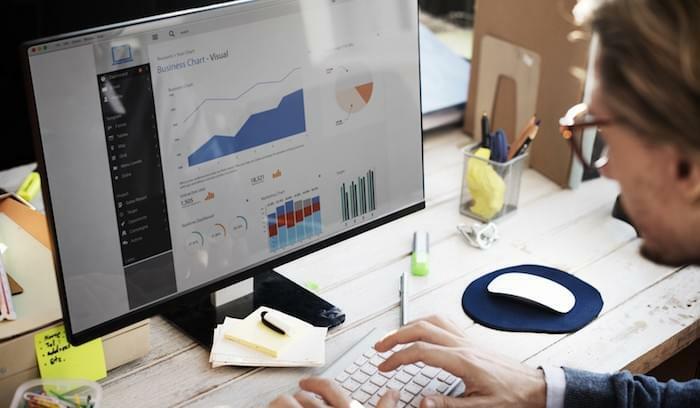 Business intelligence (BI) software aids this process by pulling data from your various client-side and back-end systems and providing visualization and analysis tools. By transforming your raw data into intelligible reports, dashboards, and illustrations, you can gain quicker insights, make better decisions about your business, and move toward positive revenue goals faster. If you’re shopping for a business intelligence solution, you’ve probably come across Domo and Tableau — two of the most prominent vendors in the space. Both offer powerful BI solutions that can process data from numerous sources for any job role, but they don’t offer the same utility and value in every area. To help you decide between Domo vs. Tableau, we’ll compare the two systems based on pricing, dashboards, reporting capabilities, and data integrations. Let’s take a look. In many cases, the way a product is packaged and priced will determine whether it’s a good fit for your business. This is especially true with business intelligence apps. It’s also one of the biggest points of differentiation between Tableau and Domo. 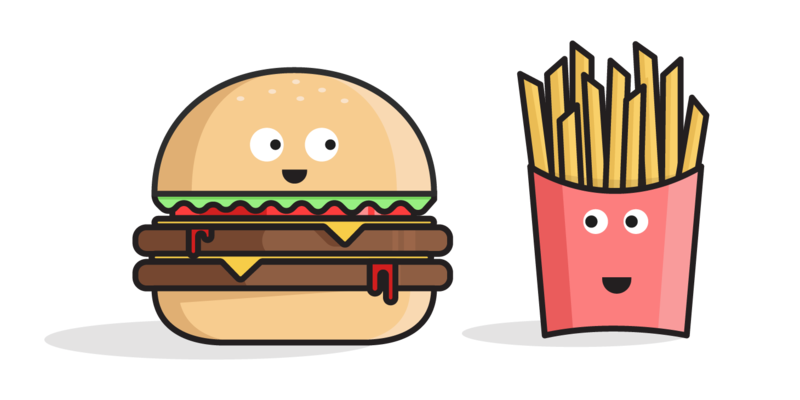 Both vendors divide their offerings into three main tiers, but with very different implications. Beyond their free, introductory package, Domo’s editions are primarily divided by number of users, support level, and administrative options. The enterprise edition offers unlimited storage, data sets, personalized data permissions, and advanced admin controls. All of their product tiers are cloud-based and priced on a monthly subscription (with annual contract). Tableau’s pricing differs between users of on-premise/public cloud and Tableau hosted, and bills annually. As is usually the case, your best value option will depend on your number of users and implementation plans. The ability to create custom dashboards is arguably one of the most important features in any business intelligence solution. Dashboards give you the ability to organize data sources, reports, and custom objects in a central location that (ideally) stays updated in real time. Tableau doesn’t disappoint here. Users can easily create interactive dashboards using custom filters and drag-and-drop functionality. Dashboards can be shared internally through Tableau Online or Server or embedded into your own wikis, corporate portals, or web pages via API connection. Embedded Analytics does cost extra, but for those who consistently distribute BI data across their organization, it’s well worth the cost. Dashboard options are only limited by your creativity and the types of data you upload to Tableau. Some users have criticized the Tableau interface and dashboards for being a little on the bland side, but the user interface has gone through a couple of updates lately that make their visualizations prettier without losing functionality. Domo, at its core, is a cloud-based dashboarding tool. When they say their platform “creates a truly digitally connected organization,” they mean it can provide insight and visibility into all of your data sources. Any sources that do not have a native connection can be accessed via API, Domo Workbench, or even a .CSV file upload. Domo dashboards tend to provide a little more vibrance and a more pleasant user experience compared with Tableau. They offer a number of different pre-built pages that can self-assemble based on data inputs (e.g. Finance, HR, Marketing, Sales, Retail), or you can drag and drop to build custom visualizations with the Card Builder tool. 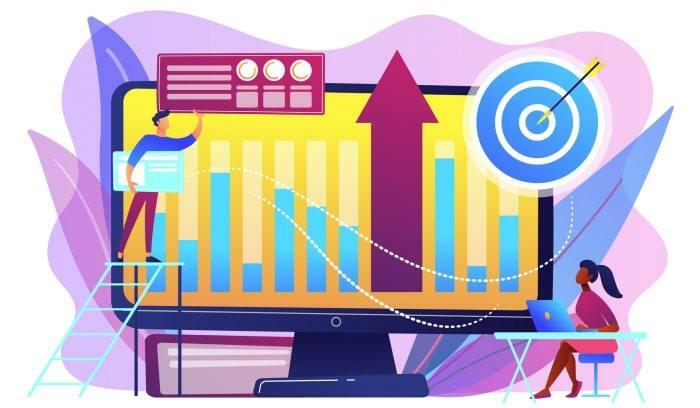 One of the major selling points of both platforms is that they make enterprise-class analytics accessible to the common line-of-business user. That means companies can process and understand their data without going through the IT department. Ignorance is bliss, but if you’re signing a year-long contract, you should at least have a basic idea of what’s under the hood. Tableau connects to your servers, databases, and web tools to gather data from across your enterprise. Their analytics features cover data discovery, data visualization, geocoding, survey analysis, time-series analysis, social analytics, and more. It integrates with R statistical programming language, and provides mobile BI access with touch-optimized features for tablets. 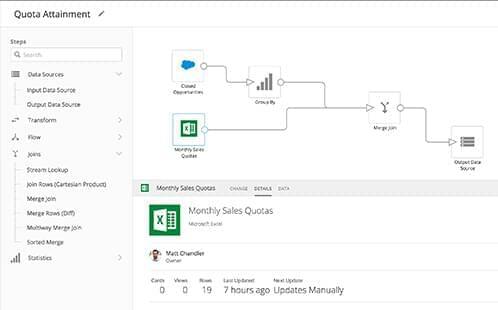 Tableau’s unique data preparation feature lets your data analysts connect to “messy” spreadsheets and fix/configure data while you sync. Pivot cross-tab data back into normalized columns, remove extraneous titles, text, and images, reconcile metadata fields, all as you build out your data. Domo gives companies the ability to analyze and cleanse their data, no matter the source. It simplifies ETL processing (extract, transform, load), so you can find the value in your data, even without formal SQL training. The DataFusion feature also lets you merge data from multiple sources. Domo also includes collaboration tools that let teams communicate directly on visualizations with messages and annotations. It also has scheduled updates and benchmarking alerts, so you know if your customer spend dips or a warehouse has dangerously low inventory. Business intelligence applications are only useful insomuch as they integrate with outside data sources like business systems (CRM, marketing automation, FSM, supply chain), servers, and databases. Tableau and Domo provide a set of native data connectors, which means they can seamlessly pull data from those sources without custom configuration or coding. An advantage in this area can make a BI platform vastly more usable. 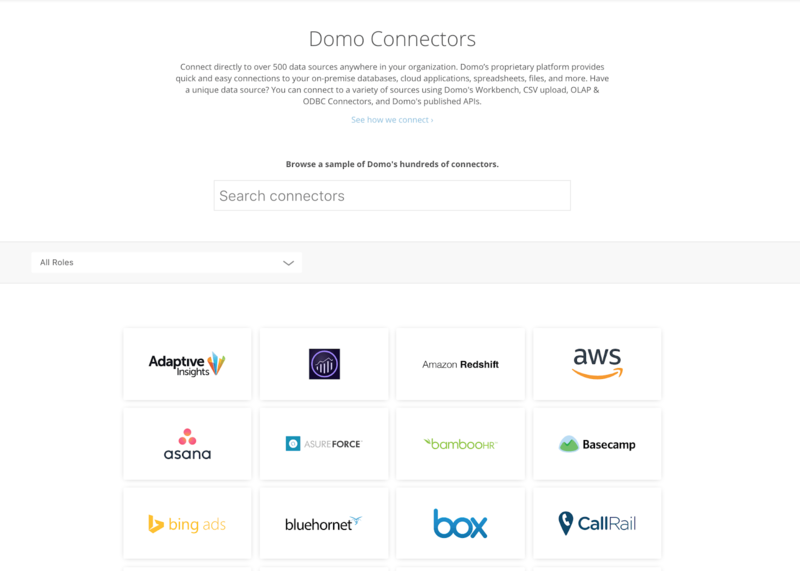 Domo boasts over 350 native integrations in their connector library. They also have a proprietary app store with pre-built solutions for different roles and industries, which could make a big difference if you’re looking for a flexible solution. 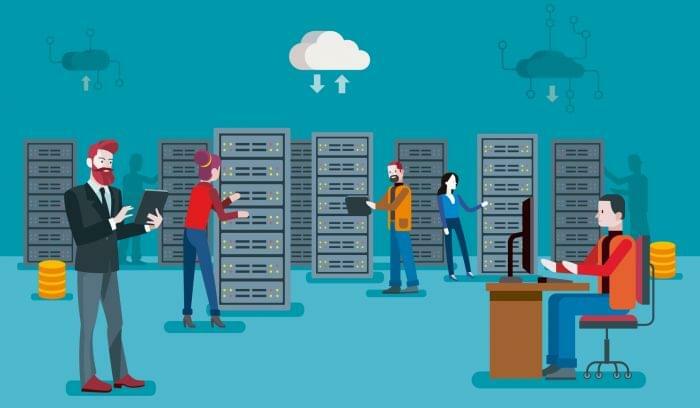 Domo can connect to nearly any data-source, virtual or physical, but it does all of its processing in the cloud. That will certainly reduce the load on your own servers, but it may mean slower speeds in some scenarios. Keep in mind, any databases or applications not listed on the company site will presumably require API integration and/or middleware to sync. Both platforms can help businesses mine data, visualize data, and make better decisions across departments. Both offer broad horizontal integration and the ability to scale as your business grows. They both even have mobile apps. The biggest differences center around implementation and pricing. If you’re looking for a strictly cloud-based app to build attractive dashboards and share access among the whole team, Domo may be the better choice. If you work in a hybrid environment and would like to provide desktop access to a few power users, consider Tableau. 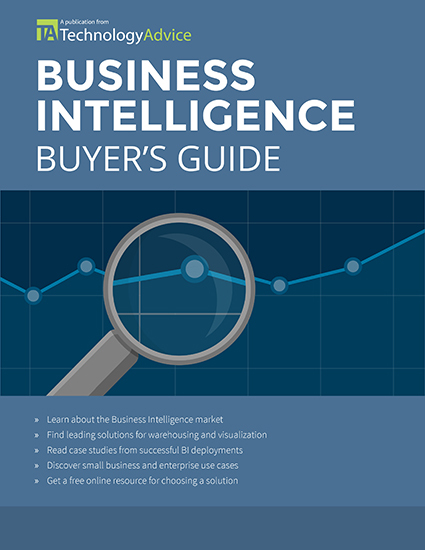 And don’t forget, Tableau and Domo aren’t the only BI solutions on the market. 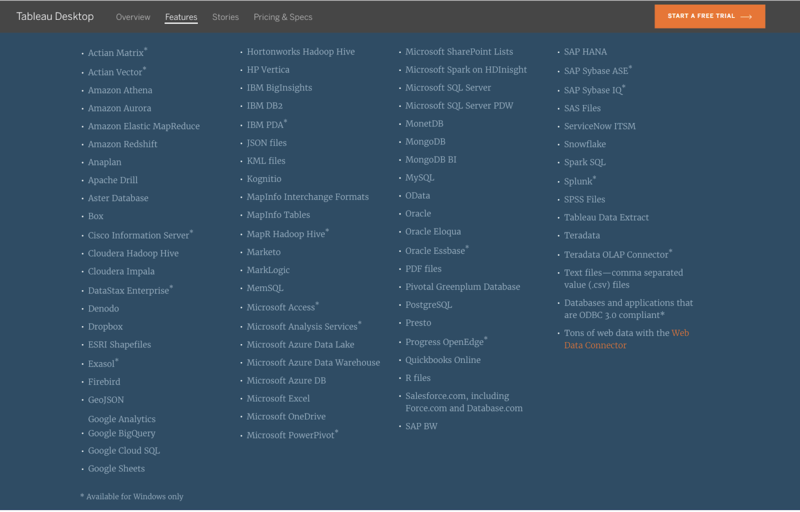 Use our our Product Selection Tool for BI software, or click on the image below to get started with a customized list of options based on your needs.